SRUUTHI HONOURED FOR HER ACTING SKILLS BY KARTIK FINE ARTS ON THURSDAY 1ST OCTOBER 2015 AT MYLAPORE FINE ARTS CLUB. 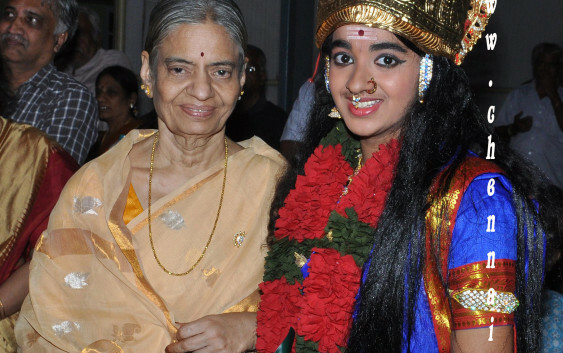 12 years old S. Sruuthi & 8th Standard student of PSBB T. Nagar was Honoured with a “cheque presentation” by PUJYASRI MATHIOLI SARASWATHY AVL for and on behalf of Kartik Fine Arts at the conclusion of the Tamil Stage Play “Sri Kanchi Kamakshi Amman” on Thursday 01st October 2015 at Mylapore Fine Arts Club in appreciation of her superb acting skills in her earlier play titled “Vydhiyar Maapillai” staged by Kartik Fine Arts on 23rd April 2015 at Naradha Ghana Sabha for elaborating on 96 Udal Thathuvangal and presently as “Bala Thiripurasundari” for spelling out Amman’s 108 names being named and used by various people across the world to Pandaasuran. In photo the secretary of Kartik Fine Arts Mr. Rajagopal Sekar.